Sink into the scent of a refreshing bouquet of blossoms with this luxurious body oil. With a fresh neroli fragrance and the extracts of white tea, this deep moisture replenishing bath & shower oil helps create a sense of relaxation and making the skin healthy and youthful. 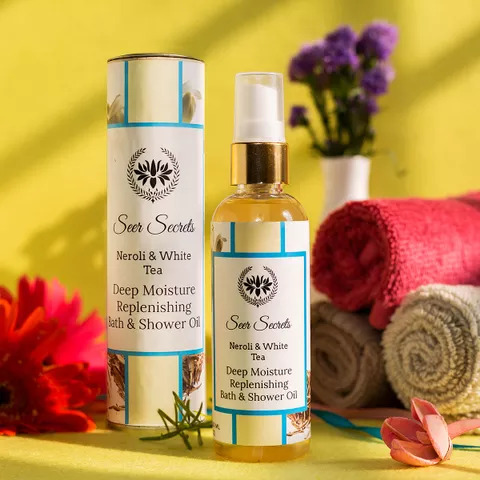 With a refreshing scent, the formula is infused with neroli essential oil and extract of White tea which provides the relaxing effect of Aromatherapy. Invigorating blossom notes stimulate your mind and spirit. This Oil results into a lavish, softening the skin with effects of visible age reversal. It gently cleanses the skin, leaving a satiny softness all over the body.